Another experiment in advertising. This handy single-serving URL is so easy to remember that we’re hoping lots of people return to it whenever they need an online stopwatch. It’s easy to use, contains just the features you need and looks fab. Spread it far and wide, please! In fact, feel free to embed the stopwatch on your own website – the embed code is right there in the stopwatch widget. Very cool, but you made the mistake made in 99.9% of computer stopwatch software. You put the START/STOP on the mouse UP instead of mouse DOWN! To REALLY make your code cool, have it catch the mouse DOWN so the instant you CLICK it registers your time. That’s not a mistake, it’s a convention! It’s funny how wrong it feels the other way round now. In general software, it gives you a chance to cancel your click if you realise it’s wrong as you click, by holding, then dragging away from the button before releasing. 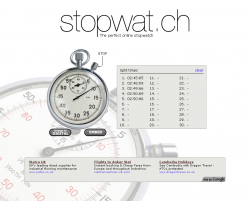 If you need more stopwat.ch precision, hold the button down, when the event happens, release.